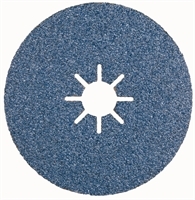 Applications: Zirconia abrasive resin fibre discs are the best general purpose disc for aggressive applications on mild steel, due to the tough zirconia abrasive grain. We also recommend our zirconia discs for general stainless steel fabrication work. Good aggression, flexibility and a long product life mean that these discs are one of our most popular products. Product Notes: Manufactured with a heavy fibre backing and a high percent premium zirconium oxide abrasive with a double coated resin bond. The K3K discs give higher performance and longer life than its predecessor and most market equivalents. For use with a back up pad. Also Available: Backing pads to suit fibre discs. We also offer the even higher performance ceramic (FX) discs which are ideally suited to demanding grinding applications for chrome steel and hard stainless alloys. If aiming for a finished surface, consider upgrading to Rapid Combi Discs which can take you from a weld to a blended finished surface in stainless steel in one operation.